A few weeks ago, friends of ours came to visit. They always bring interesting, food-related gifts. 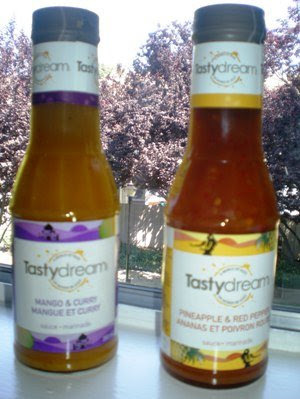 This time was no different as they brought two marinades: mango & curry and pineapple & red pepper. To be honest, I am not a big fan of fruit in savory dishes. So I let the marinades sit in the cabinet for a few weeks. However, the other day, we had two pieces of wild salmon sitting around that I wanted to cook, but I was a bit bored of my usual citrus-based sauce/marinade (usually lemon juice & herbs). So I decided to give one of the marinades a try. Hubby picked the mango curry marinade. We coated the fish with a thin layer of marinade - I didn't want the dish to be too sweet! Put it in the fridge for several hours. We then baked it at 350 degrees for about 15 minutes. It was delicious. The marinade added a nice sweet flavor to the fish, but it wasn't too sweet (which I had secretly been afraid of...). I usually prefer to make my own marinades from scratch, but this was very good and very easy. It's nice to have a shortcut to make a new and interesting dish in no time. I can't wait to use the pineapple & red pepper marinade soon. Questions: Do you like fruit in savory dishes? What's your favorite sweet/savory dish? I seriously don't know! I guess I should experiment and figure that out! we eat most of our meats... al natural. so glad you tried your new marinade though! I really do like fruit in savory dishes. I especially like putting fruit on my fish (such as mongoes). Fruity salsas are really fun to add to meat/poultry/fish, or even in burritos. The fruit marinades look great to me! I'm with your. I don't really care for fruity marinades. I'm glad you liked it though! Even though I love the Asian sweet marinade that you find on salmon in restaurants, I would have probably opted to serve both of those with chicken. We always want to play it safe and look at all the great things we would miss out on if we didn't take a chance once in awhile! Ahhhh, I'm once again reminded of the salmon in the freeze(probably with freezer burn) waiting for me to make it!! Ummm, I will eat fruit in savory dishes(since I eat anything) but normally it's something I avoid because it's not how my mom cooked while I was growing up so I'm not used to it. I like adding strawberries to my salads. Does that count? im not a fan of fruity/savory dishes either!!! But since you liked it I just might have to try this! Mmm the pineapple and red pepper sounds really good--I really do love fruit in my dishes. However, I'm not a big fruit in my dessert kinda gal! I use to be a big fan of sweet and sour chicken chinese food! I can't think of the last sweet and savory dish I had. Gonna add this to the list of things to brainstorm and try! I typically am not a fan of fruit/savory combo but a few weeks ago tried mango with some savory and really loved it (maybe my tastebuds have changed?) The salmon and marinades sound so good!